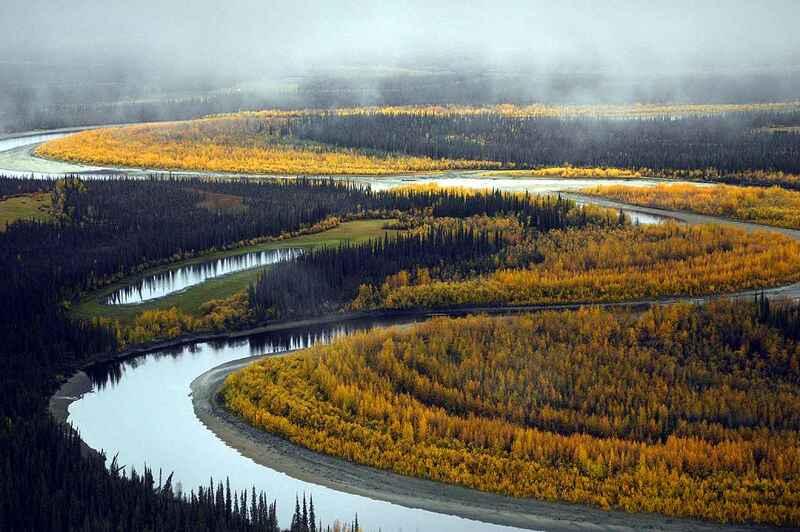 I believe the best way to introduce Mississippi River is to let the blend’s story speak for itself. Well, a dear friend of ours and member of the club, Joe Lankford, was blending tobacco in his garage. He had been blending for about 25 years before he ever created a blend that he thought was smokable. Pretty incredible story, isn’t it. Actually smoking this blend is just as powerful as this story. From the first hit Mississippi River captures your attention with deep creative flavors, firmly holds it hostage as it continues to impress, and releases it only when the bowl is complete. Opening a tin of Mississippi River is really fun. Because a significant portion of this tobacco remains the thick broken flake it was intended to be, popping the seal is a lot like getting that first glimpse of your filet mignon you ordered countless minutes ago at your local steakhouse. It is just a feeling of pure joy and excitement we seldom experience. Mississippi River’s tin note is a calm and fairly uneventful melody of tobaccos. A steady dose of Virginia leaf is apparent. A deep inhale informs us that a healthy serving of Perique tobacco is working in unison with the Virginia. It takes a more matured olfactory system to pick up on the Latakia and Turkish Orientals in the blend, but if you know what you are looking for, they can be detected. One aspect of Mississippi River I love is how easy it is to rub out. I do not believe I have ever rubbed out a flake or coin that cooperated so easily. Unfortunately, I have one small issue with the blend: it is moist. I let my batch dry out for a couple of hours to give me a better smoke. I smoked this blend in a different pipes (including a Savinelli Hercules 320 EX, a Stanwell Canadian, and my trusty Missouri Meerschaum cob). To get the most out of Mississippi River, I suggest avoiding wide and shallow chambered pipes (like my Savinelli 320 EX). Instead put it in a deeper, more narrow chamber. The flavor was too dull in the wide chamber, but I found that I could taste the more subtle flavors, like fruit and chocolate, in a narrower bowl. 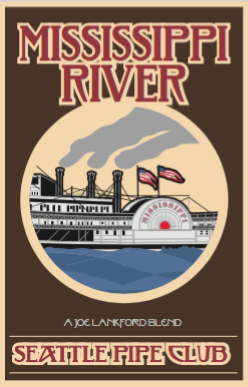 As for the overall flavor, Mississippi River is a warm, rich, and smooth hit of flavor. Just as a bit of butter melts over that filet mignon you have been waiting on, this tobacco slowly covers your mouth with an avalanche of flavor. Now I must go back to the moisture issues with the blend. No matter what pipe I smoked it in, it got hot! A bit too hot if you ask me. Even though it didn’t burn my tongue (thank God, because I would hate not to enjoy this blend), I did have to take a break, even with some of my larger pipes, and let the bowl cool off so I could hold it. Often times I try smoking my blends using DGT (delayed gratification technique). DGT is smoking half of a bowl, and then coming back a few hours later to smoke the rest. Sometimes the flavor of the tobacco will change, but not always. Mississippi River most definitely changed. Before what was silky and smooth, was now sharp and deliberate. It was a whole new smoking experience! Same flavor, same tobacco, but a completely different smoke. With a blend containing as many strong components as this, you would expect a rank amalgamation of smells that pushed some away and turned over the stomach of others. But actually, Mississippi River’s smoke is not that bad. Sure it is a strong smell that will move around your home with liberty, but it is not at all unpleasant. I don’t mean that it smells aromatic, like marshmallow and daisies, just that it won’t turn too many people off. I was surprised. With a moderate nicotine level, and cohesive flavor, Mississippi River is a blend perfect for pipe smokers to smoke around breakfast time. With that in mind, I believe pairing it with either a mild cup of coffee or a warm tea is perfect. Be careful not to go too strong with either of these, or it will over power the tobacco, and then you will just be wasting precious tobacco. There is no doubt in my mind the strength of Mississippi River. Mississippi River is a medium tobacco. It really is pleasant. It can be smoked by anyone, at any time. I have a confession to make: this is hands down my favorite blend from Seattle Pipe Club. 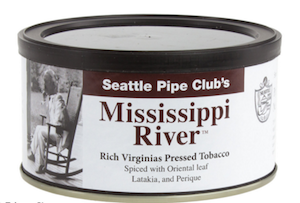 I know that many smokers prefer a different blend from SPC, but I have always loved Mississippi River. However, I cannot score this tobacco with a carefree heart. As much as I want to rate this tobacco based on my own preference, I have to give it an accurate score. I give Mississippi River a score of 8 out of 10. If it didn’t burn so hot I would have given it a nine. The good news is that I believe we can fix this problem. So I don’t know about you, but I wasn’t disappointed with my filet mignon. It was just as tasty as I was led to believe. Even with my high expectations, Mississippi River delivered. Well, I showed you my cards. Now you know that Mississippi River is my favorite SPC blend. So, in a comment below, tell me what your favorite Seattle Pipe Club blend is! ← Seattle Pipe Club: How Balkan is Pike Place? Great review! Absolutely love this baccy! Thanks for the review. Thanks for doing all this coverage on the Seattle Pipe Club and their blends, I’ve enjoyed reading it. I’ve heard so much about their blends on Instagram, so I’ve wanted to give one of their blends a go. Mississippi River sounds like the right one for me to order, based on your review. I strongly suggest it. I will eventually get out a review of each of their blends.